Looking at pictures online at DrBott.com, I knew the iHome iH24D was a small unit, but just how small was not apparently clear until I set it up with an iPod connected to it. This is a very small, but surprisingly robust, speaker. It looks like an older Boston Acoustic shelf speaker I owned back in the early 1990’s, but turned on its side. 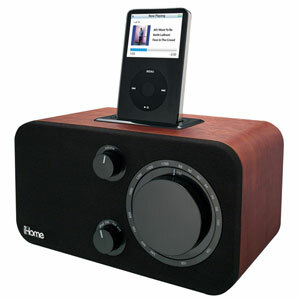 The look of the iHome iH24D is the most appealing aspect. While not great audio quality, for the price and what it is, it is more than adequate for a small room, or sitting on an office shelf. The woodgrain compliments the black front grill and control knobs well. This is one iPod speaker that does not look cheap or inexpensive. The front of the iHome iH24D sports three control knobs: a smaller knob that turns it on/off with volume adjustment, and another like-sized knob to control input between iPod, AM, FM, and Auxiliary input. The giant knob on the right front of the unit controls the radio frequency. The look is very 1970’s hi-fi gear in appearance, a welcome change from all the plastic black, tan, and white gear we usually see in similar devices that sport an iPod dock. Speaking of the iPod dock, it’s located on the top of the unit, and it does ship with various docking adapters to fit different size iPods. The iHome iH24D will also charge your iPod while it’s docked. And while not officially compatible, the iPhone and iPod Touch works just as well with the iHome iH24D as any other iPod. Audio quality is that of a fifty dollar iPod speaker. That is to say, not the highest quality. But for the price, and the appearance, I really have no complaints in audio quality. It sounds good enough. While that may not read like a ringing endorsement, please be aware I am very picky when it comes to audio quality. Good enough in a fifty dollar speaker system is high marks from me. The AM/FM radio works well. It picked up some stations that other radios I have do not. Precise tuning with the huge analog control knob means tuning detail is great. The unit does come with both an FM and AM antenna. It does have a mini-stereo AUX input jack for other audio equipment. I tried it using a PSP, and it works and sounded great. On the negative side, the iHome iH24D only works with a power plug, so this is not a portable unit. It’s not advertised as such, but with most of the iPod dock speaker systems out there able to be used portably, it is strange to have something so small and inexpensive not be somewhat portable as well. Also, there is no remote control for the iHome iH24D, so this is a set your playlist and forget it system. If you need or want to change the song, you have to go to the unit. A remote would have been most welcome. All in all, I like the iHome iH24D. Small, attractive, and priced just right, I would think this a good birthday gift for an iPod owner, or as a second iPod speaker system in another room. MyMac.com Rating: 4 out of 5 based on price and appearance. Love the vintage look!